It happens many times that you need your computer’s IP address. So, if you’re searching for your IP address, then don’t wander here and there. This article will help you find your IP address very easily. Not only this guys, I compiled the 4 extremely simple ways to find out your PC’s IP address in seconds. So, be ready to learn how to find out IP address of your computer. All the listed 4 ways are simple but some of them you may find extremely easy and you will be able to find the IP address in no time and without any effort. It is a simple method to find the IP address of your computer. You just need to follow the steps to learn this method for finding IP address. Go to Control Panel and search for Network and Sharing Center in control panel search bar and click on it. 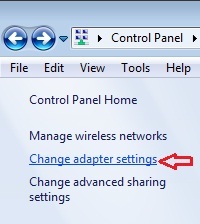 In the next screen, click on Change Adapter Settings as shown in the following picture. Now, double click or open any active network connection and click on Details. Finally as you click on Details, you’l be able to see your IP address in the next screen. So, in the above screen, the IPV4 address is your IP address. Isn’t it so easy! Did you felt the above method slightly lengthy? Don’t worry, this method will give you the fast result as compared to first method. So, you can also find out the IP address of your computer using command prompt. This is simpler than above method because you just need to remember single command. Press and hold Win Key+R, type cmd in the run command box and hit Enter. Now, type ipconfig in command prompt and hit Enter. The IP address will be disclosed as shown in following picture. That’s all, so isn’t it simpler than the above one. So, you can use this method too for finding your IP Address very simply and instantly. You can also find your IP address using some of the online services. Yes, there are many websites on the Internet which enables you to find computer’s IP address without any effort. So, one of the many services for finding IP address online is whatismyip.com. As soon as you visit here, it will show you off the estimated IP address of your computer without doing anything. The remarkable thing is that the online services gives the estimated results, not the exact. It is the simplest method to find IP address of your computer. We know that Google is over smart but still this method doesn’t provide the exact results. To find the IP address of your computer, you just need to visit Google and enter ip address in the search bar and hit Enter. You’ll find that Google automatically fetches the public IP address of your computer in front of you. However it may be estimated. I know the last two methods are very simple to perform but if you want to know your exact IP address, then don’t go behind the simplicity but you should follow the first two methods which will give you the exact IP address of your PC. Good luck!